The Repsol YPF La Coruña refinery is a high-conversion site with both coke and FCC units. The complex energy system is based around five steam headers and two cogeneration plants, and has several degrees of freedom. Manipulating these degrees of freedom using a cost- based optimisation program results in significant savings in operating costs. This is particularly important within the current deregulated electricity markets. Since the electrical system is one of the main economic trade-offs with a steam system, electricity deregulation makes it harder to operate the overall combined systems at a minimum cost. Also, utility systems are continuously evolving and a lack of sensors can involve either estimating or calculating non- measured consumptions with modelling systems. Occasionally, there is also a lack of sensors that need to be addressed properly. Furthermore, utility systems have several constraints, usually originating from the operations side. Finally, it is also important to note that traditionally, given the complexity of the system, utility optimisation is managed by different refinery areas, but individual area optimisation does not necessarily yield the true global refinery optimum. The La Coruña refinery is divided into two main areas, more than 3km apart from each other. One is called Nostián, the conversion area where the utilities plant, FCC and coke units are located, and the other is Bens, or the refinery area, where several users such as the crude units are located. The main high-pressure steam users are the FCC and coke units, fuel oil heaters, a turbo generator and the cooling water system area. One of the levels of the medium-pressure steam headers is supplied by letdown from higher levels (through turbines or letdown valves) and by the turbo generator. Users of this steam level are almost all located in the refinery area (Bens). The other level of medium-pressure steam is supplied by letdown from the upper levels (by letdown valves or turbines) and by the FCC, coke, vacuum and medium-pressure heat-recovery steam generator of one of the cogeneration units. Users of this steam level are almost all units located in the conversion area (Nostián). The low-pressure steam headers are supplied by letdown from the upper levels (letdown valves or turbines), some steam generators and flash tanks. Users of this steam level are units located in both the conversion and refinery areas. Electricity generation is performed by the two cogeneration units, including the turbo generators. The refinery is usually an exporter of electricity, but is also able to import electricity if necessary, since it is connected to the external electricity grid. There are several suppliers and users of fuel gas, the most important being the gas turbine of one of the cogeneration units. When the fuel gas density or pressure decreases, propane is automatically added to the network. The main objective of the project was to make available a tool for the online optimisation, auditing and monitoring of the energy system. Such a tool could also be used for engineering studies, such as evaluations of operational changes, investment projects, and shutdown and startups, taking into account both the technical and the economical impact on the energy system. Other successful implementations of the same technology were taken into account when deciding the objectives, including the following Repsol sites: Repsol Tarragona refinery, Petronor Somorrostro refinery, YPF La Plata refinery and Repsol Química Ensenada petrochemical complex. A model of the entire energy system was built, including the fuel, steam, BFW, condensate and electrical system. Steam is generated in several units with conventional boilers, heat-recovery steam generators and two cogeneration units with possible steam injection. There are also two steam turbines that generate electrical power. The five steam pressure levels and the units were modelled to a high level of detail, including all the users and suppliers of the respective steam, BFW and condensate headers. Electricity and fuels supply contract details were also included in the model, together with the market cost of electricity from the real- time database system. Figures 1 and 2 show the Visual MESA model of the two main refinery areas. By navigating through the model, each individual unit can be monitored in detail. The fuel gas network was also modelled (Figure 3) due to its involvement in steam and power generation, and all its constraints and degrees of freedom were taken into account. 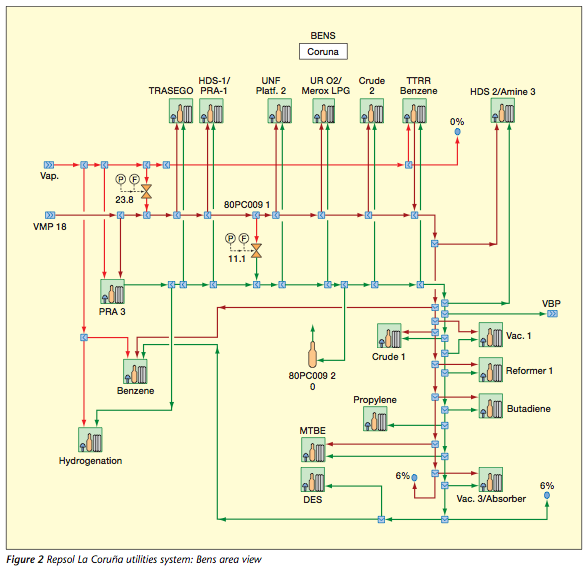 Visual MESA features mathematical models and built-in optimisation routines that make it possible to calculate how to run the steam and electrical systems at a minimum overall cost, while still meeting the required plant steam demands and other plant constraints. The software determines which boilers or steam generators should make incremental steam and which turbines or letdown valves will most efficiently let the steam down between pressure levels. The SQP optimiser's job is to minimise this objective function, subject to operating constraints in the system. Total fuel cost is determined by the fuel use of each boiler and combustion turbine, multiplied by their respective fuel prices. Total electricity cost is determined by the net electricity use of each motor, load and generator, multiplied by their respective electricity prices. The model takes into account the electricity price corresponding to the actual hour of the day as well as the penalty associated with selling more or less of the market- arranged exportation set point. Miscellaneous costs are normally used to charge for demineralised water coming into the system, but cover other costs related to the energy system, such as CO2 emission costs. 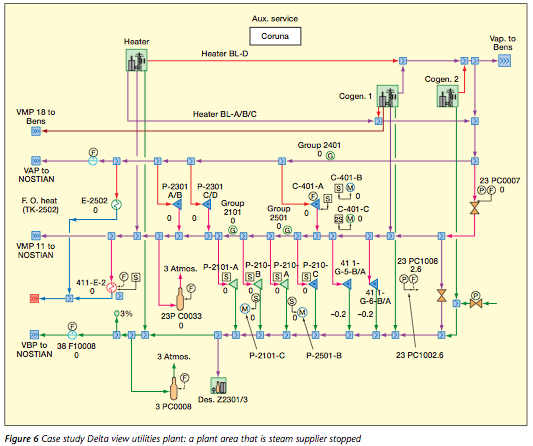 A model to calculate and optimise CO2 emission costs was developed and can run alongside the electricity, steam and fuel optimisation routines, and help choose the best fuel to use in boilers and gas turbines. 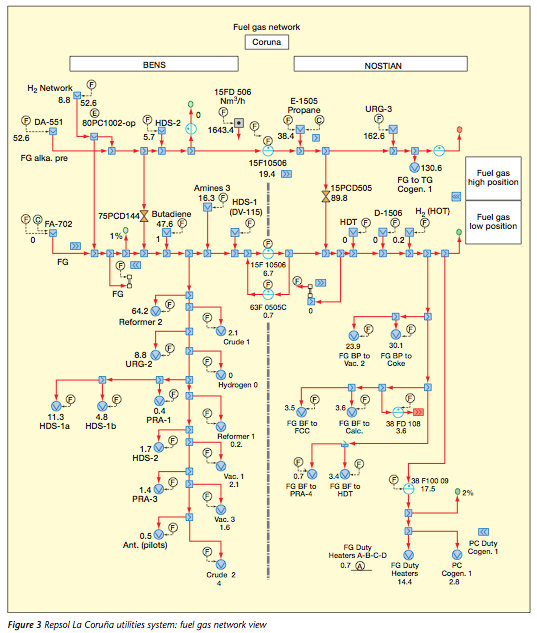 The fuel gas network was also modelled to consider the complex constraints and different fuel availability. Microsoft Excel provides a familiar environment for users to generate reports and views of the simulation and optimisation of the system. It also enables users who are not familiar with Visual MESA to take advantage of the information it provides. Data comes to Excel directly from the model. As Visual MESA is built around .NET technology, it can communicate seamlessly with Excel. Visual MESA also generates automatic HTML reports, to allow everyone on the intranet to see how the utility systems are being operated and what the potential savings are. By auditing the energy system, imbalances can be identified and reduced. The data can then be relied on for evaluating the value of energy production and usage, and wastage can be eliminated. Visual MESA helps to locate wasteful steam usage. Balloons are used to measure steam balance closure. They perform the algebraic sum of all the flows for streams entering and leaving the balance. Since there is a value for the flow of every stream, the total should be 0.0 (all the steam that comes in must go out). If the net balance is not 0.0, some meters or estimated equipment flow rates are erroneous, or there is steam leaving or entering the balance that has not been accounted for. The balloons dynamically show meter errors by changing size and colour, depending on the amount of steam imbalance. Balloons are placed where there is a chance of a closed mass balance (Figure 4). CO2 emissions cost has been taken into account according to the Kyoto protocol. A special modelling block with the emissions factor for each fuel and the CO2 cost has been added. Visual MESA adds the CO2 emission cost to the total cost equation, so when it minimises the total cost it is taken into account with all other costs (fuels, electricity, demineralised water) and the optimum fuel feed to boilers and gas turbine is suggested. In principle, as the energy cost reduction is given mainly by a reduction in fuels consumption, this always implies a CO2 emissions reduction, except where the optimisation recommendations are related to the consumption of a cheaper fuel, but that generates more CO2 instead of using a more expensive fuel that generates less CO2. This could be the case when replacing natural gas with a heavy liquid fuel. This challenging trade-off is affected directly by the CO2 allowance price. Visual MESA helps to evaluate potential capital or operating changes to the refinery, and assess the economics and operability of the changes. It can also automatically evaluate multiple what-if scenarios by using its Excel add-in. During a what-if scenario, the current site status (or the corresponding optimum calculated by Visual MESA) can be compared with the optimum case study and easily analysed. All imbalances are maintained constant and the steam production is allocated to the new demand/request proposed scenario. The economical impact of adding a new natural gas line feed to the gas turbine needs to be evaluated. This investment project would allow the replacement of its gas oil feed. It can be done by simply changing the fuel to the gas turbine and running Visual MESA on what-if mode (balloons locked). By running this study, significant savings have been identified together with a CO2 emissions reduction. 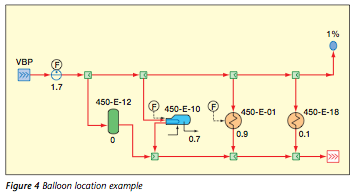 Another what-if example is how to operate the refinery when one plant is shut down – for example, a unit that is a high steam supplier for the refinery (see the plant area called AL in Figure 1). It takes BFW, fuel gas and medium-pressure steam and exports high-pressure steam to the refinery. If this plant is shut down, the refinery has to adjust its steam production to adapt to the new situation. This can easily be simulated with a what-if case study, and Visual MESA finds the most economical way to operate the energy system. Working with the model in standalone mode, with the current operation values, run the optimisation and set the results as the base case. Then, disable the plant area AL and finally run Visual MESA again with the balloons locked. The solution can be observed through reports and by different views in the model. Visual MESA automatically allocates the steam production to satisfy the demand into the boilers and cogeneration units. As there is some fuel gas that it is no longer used by AL, there is a trade-off among boilers, the gas turbine and its post-combustion unit that is done automatically by Visual MESA. It can also generate electrical power, while suggesting the most economical turbine and motors operation. Figures 5 and 6, with the highlighted steam lines, correspond to the Delta views (Nostián area and utility plant area); that is, the difference between the base case and the comparison case (AL disabled). 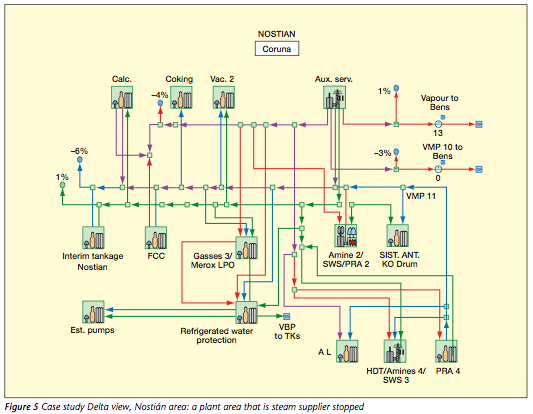 The changes in the energy system to optimally manage the proposed situation can be observed. Operators have a set of optimisation recommendations to operate the energy system at a minimum cost. The tool also acts as a "watchdog", since supervisors can evaluate how operators manage the energy system. Prior to applying the recommendations (or when recommendations are not taken into account), there is variability in the way the system is operated. As soon as Visual MESA is commissioned and put into use, this variability is eliminated, as shown in previous implementations. As a result, the optimisation suggestions can be achieved properly through the existing operating and control procedures. Since Visual MESA is an operational tool, proper training of the operating personnel is important. The different shifts have been trained using the La Coruña refinery model. Feedback from the operators during and after the training classes has helped make the application easier to use, improving the report views and the displayed information. To facilitate the implementation, at the beginning the optimiser was run at Level 2 (only continuous variables) so it could be handled by operators more easily. In a second stage, discrete variables were considered. In case a sensor does not exist or has failed temporarily, Visual MESA utilises calculated or estimated data. The main meters needed for optimisation are: cogeneration (steam flow rate), boilers (steam flow rate), letdown valves, vents, and on-off status for motor turbines. New sensors have been located to automate the capture of the on-off status from the PI system. Following in importance are those sensors that provide data to the model but are not changed by the optimisation. Optimisation can still be performed and implemented without these sensors (reboiler steam flows, temperatures and pressures). Less important sensors are those only used for monitoring and do not participate in the modelling. Allow centralisation of the responsibilities of operating the system optimally. 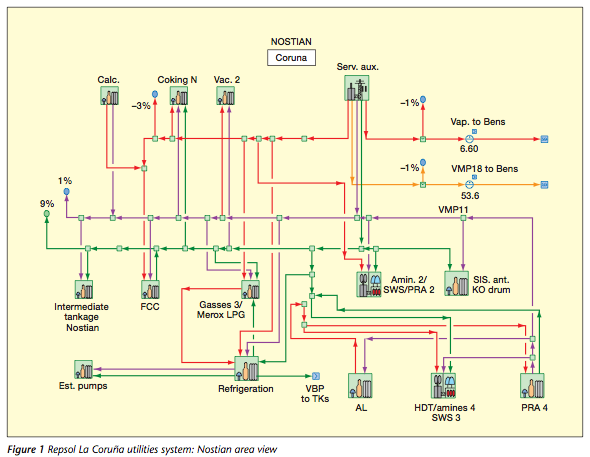 Energy costs reductions can be obtained by taking advantage of Visual MESA's functionalities. It is a robust optimiser well suited to routine operation. The model helps to evaluate what-if scenarios that include changes to the utility system. Auditing and accounting of the steam and BFW reduce wasted steam and identify imbalances. Finally, continuous monitoring prevents plant upsets and helps to quickly identify steam wastage. It is important to emphasise the high involvement and motivation of the plant operators since the beginning of the software implementation. Co-ordination among plant areas is critical if the proposed optimisation recommendations are to be implemented successfully, so management involvement is crucial too. The robustness of the tool helped operators to gain confidence in the system. User acceptance and widespread employment are also key to success. Ruiz D, Ruiz C, Mamprin J, Depto Energías y Efluentes Petronor, Auditing and control of energy costs in a large refinery by using an online tool, ERTC Asset Maximisation Conference, Global Technology Forum, 23–25 May 2005, Budapest. Ruiz D, Ruiz C, Nelson D, Roseme G, Lázaro M, Sartaguda M, Energy costs reduction by using an online utilities optimization tool, ERTC Computing Conference, Global Technology Forum, 17–19 May 2004, London. engineering from Universitat Autónoma de Barcelona, and a petroleum and gas technology master from Instituto Superior de la Energía in Madrid. Blanca Garrote Pazos is a chemical engineer with Repsol Petróleo SA and is located at the La Coruña refinery. Garrote Pazos has 15 years of experience in the petrochemical industry. with Soteica Europe SL, Barcelona, Spain. Mamprin holds a degree in chemical engineering from Universidad Nacional del Litoral, Santa Fe, Argentina. at Universidad Tecnologica Nacional. Alberto Ruiz holds MSc and PhD degrees in chemical engineering from Universidad del Sur, Bahia Blanca, Argentina.